Pierce Transit’s Pacific Avenue High Capacity Transit Study is in full swing. 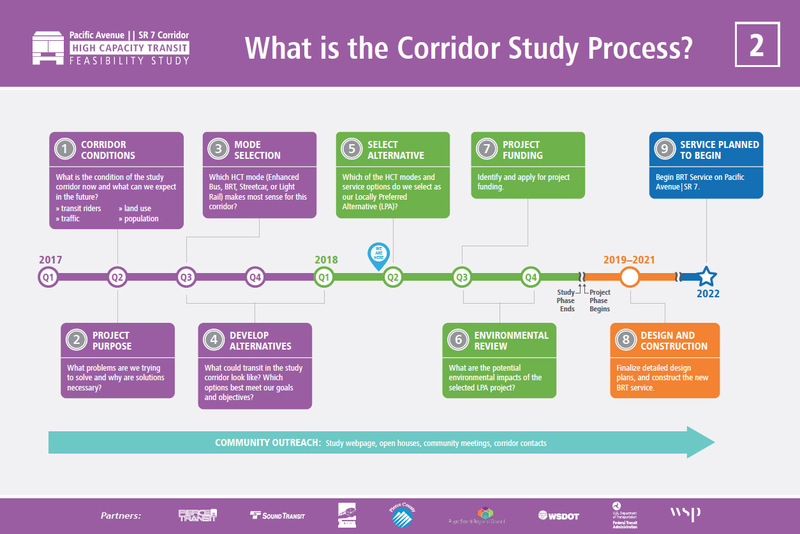 After over a year of studying the conditions of the corridor and two public open houses, Pierce Transit selected Bus Rapid Transit (BRT) as the mode to move forward into further project development. The reasoning behind selection of BRT revolved around increasing transit ridership, increasing capacity, and an ability to support transit oriented development. The project is currently in a stage of alternatives development with selection of a preferred alternative to occur sometime in June. The 14-mile corridor spans from the Theater District in Downtown Tacoma to Pacific Lutheran University and Parkland Transit Center and on to Spanaway in unincorporated Pierce County. This project is expected to replace 15-minute bus service with 10-minute service along this segment of Pierce Transit Route 1. It will also likely exchange existing 40-foot coaches for 60-foot low or zero emission vehicles. One note, the scope of the project does not include the 6th Avenue portion of the route to Tacoma Community College. Since the last open houses in November, Pierce Transit and their consulting partners WSP, have taken in public comment and modified the alignment in Downtown Tacoma to avoid congested areas of Pacific Avenue, instead opting for an approach to Downtown Tacoma from Tacoma Dome Station that relies on South 25th Street and Market Street. 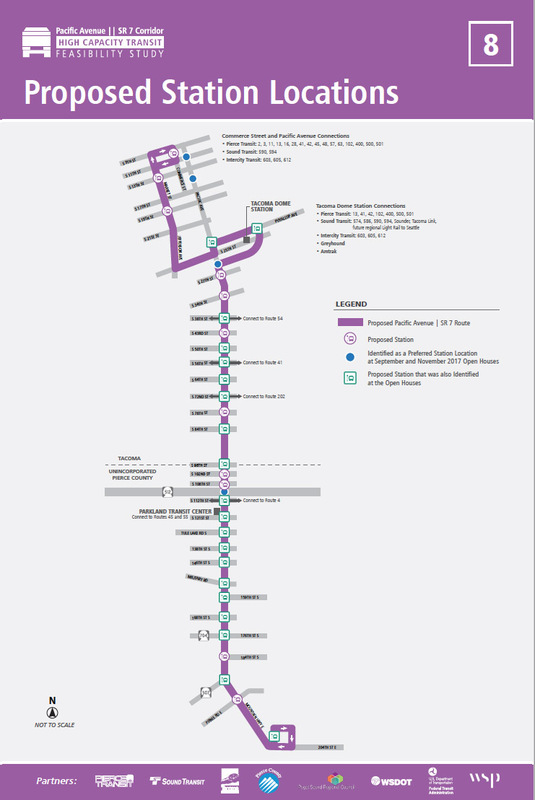 Additionally, the new rapid transit route deviates further from Pacific Avenue to East G Street at the regional express bus platform versus a more minor deviation to East D Street at the Sounder station platform at Freighthouse Square. The principal question at the recently concluded third and final round of open houses is deciding between two corridor treatment alternatives to improve transit speed and reliability. Both alternatives retain four general purpose traffic lanes, as is the case today. 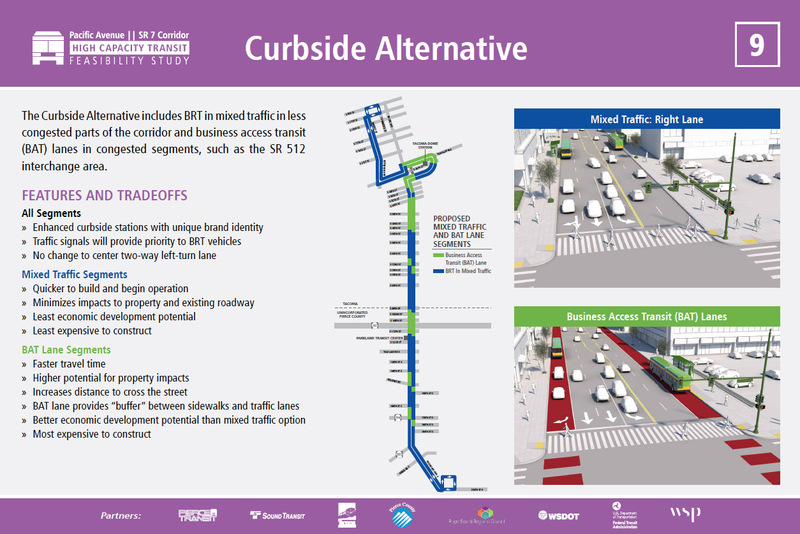 The Curbside Alternative would widen Pacific Avenue at specific points along the corridor and implement business access and transit (BAT) lanes. This alternative would have conceptual treatments near 176th St, Military Road, at the SR-512 interchange, near 72nd St, along a stretch between 34th St and 38th St, and in Downtown Tacoma along Puyallup Avenue. Outside of the BAT lanes, transit vehicles would operate in mixed traffic. Additional traffic signal priority is slated along the entire stretch. Interesting enough, this more fragmented alternative is more expensive and provides less reliability and speed enhancements than the Median Alternative. The Median Alternative would create a 6.5-mile contiguous stretch of exclusive bus lanes from Parkland Transit Center to the southern portion of Downtown Tacoma at South 26th Street, fulfilling the promise of gold-standard bus rapid transit. Buses would run in the middle of the street, replacing the current median left turn lane. Key intersections would allow U-turns to facilitate vehicle access. Instead of servicing central median stations with five door coaches as envisioned initially, the concept displayed at the open house showed split stations at either side of an intersection, which would be serviced by three door coaches. The consultants indicate this configuration may be more expensive than median stations due to the sheer number of stations. Other portions of the corridor outside of the bus lanes would operate in mixed traffic with the exception being Puyallup Avenue, which would implement BAT lanes like the Curbside Alternative. 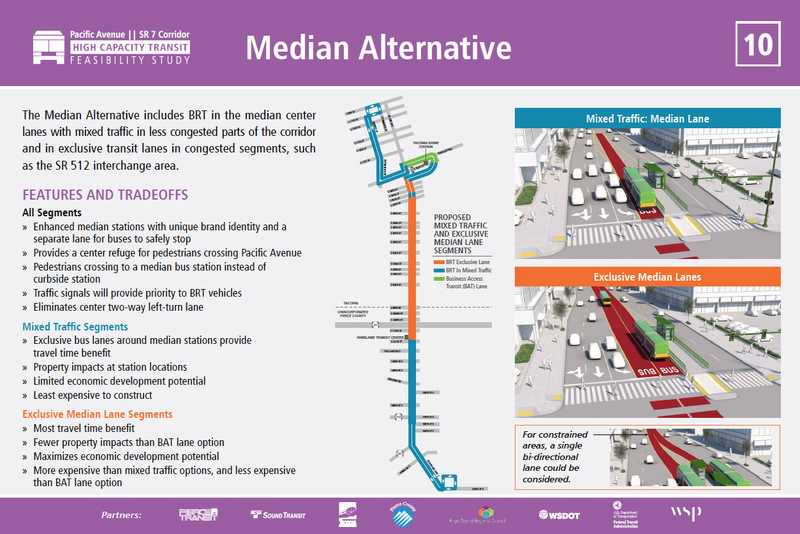 The Median Alternative, although creating more exclusive transit right-of-way is less expensive and has fewer impacts to businesses because less property acquisition is necessary. This alternative also provides more reliability and speed enhancements than the Curbside Alternative. Between now and adoption of the preferred alternative the project team will be reviewing comments from the public, consulting with affected jurisdictions, and making amendments to the plan. The project alternatives are being reviewed by 12 different evaluation criteria, including improvements to transit reliability, pedestrian safety, and corridor revitalization. Riders and transit advocates are encouraged to make comments via Pierce Transit’s Online Open House, and to help Pierce Transit weight the evaluation criteria. Pacific Avenue HCT is currently funded with $15 million from a Washington State transportation package and $60 million from Sound Transit 3 as an early deliverable. Pierce Transit is aiming to have an application for a Small Starts Grant in by third quarter of 2018 with design and construction occurring in the 2019-2021 timeframe and service opening in 2022. Next articleTour the Future University of Washington with The Urbanist on April 14th! Chris Karnes a native of Tacoma and well known local writer behind the Tacoma Transit blog.